The Mighty Ukes, founded and run by Sophia Tara, meet every Tuesday @ 7pm – 8.30pm at The Office Bar & Cafe, 124 Riddiford Street, Newtown. Open to everyone who loves to Uke and Sing. Absolute Beginners, Veteran Ukers and Ukulele Lovers from everywhere. Free Entry and Weekly Ukulele Sessions. No annual subscriptions. Koha/donations gratefully accepted. A projector and big screen are used for songs so just bring You & Uke. Fun, laughter, joy are compulsory. Open Mics are held last Tuesday of every month so you can strut your stuff. 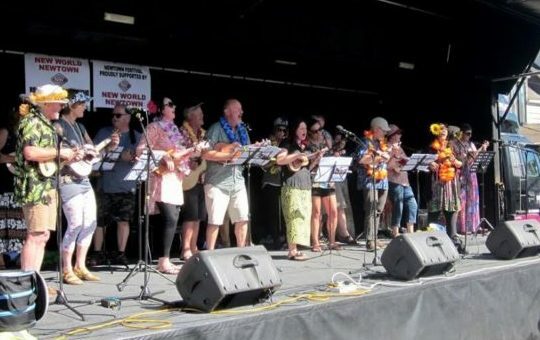 The Mighty Ukes perform at Community Festivals and are invited to play gigs throughout the year. Visitors are warmly welcomed with plenty throughout the years from all over Aotearoa-NZ and travellers from Australia, UK, USA, Ireland, France, Germany, Holland, Spain, Argentina, Chile, Brazil, China, Japan, South Korea, Indonesia, Malaysia. The Mighty Ukes offer monthly Ukulele Classes to beginners who then join their Weekly Meetups. They love to network and build happy fun communities.